Toronto Transit Commission 4400-4603 are low floor light rail vehicles built for the existing streetcar network and are part of Bombardier's Flexity family. The 30.2-metre-long cars can seat 70 passengers and accommodate 181 standees. Inside, the cars feature two spaces for bicycles, SVASAS (automated announcements), passenger assistance alarms and intercoms, and CCTV cameras. Routes with the new streetcars use the proof of payment system with all-door boarding. Passengers are issued a proof of payment when they pay their fare or purchase tickets from machines at stops or on-board the vehicles. Paying with Presto debut in December 2014 with readers available at all doors. Currently, the new streetcars can be found on routes 301, 304, 310, 501, 504, 509, 510, 511, and 512. The first two new streetcars, 4400 and 4403, entered service on August 31, 2014 with a ceremony at Spadina Station. The cars were introduced on the route 510 Spadina first. The following year in March, the new streetcars were introduced on the 509 Harbourfront. Under the original plan, 511 Bathurst and 505 Dundas would receive them later in the year. The 501 Queen, 504 King and 508 Lakeshore would follow in 2017. Deployment on the 502 Downtowner, 503 Kingston Rd, and 512 St.Clair would follow in 2018, with the final route, the 506 Carlton, to receive the new streetcars in 2019. The new 514 Cherry streetcar route, introduced in 2016, received the new streetcars after the 509 instead of the 511. The 504 next received the new streetcars in January 2016, but on weekends only. The revised plan will see the new cars deployed on the 512 September 2017, the 511 in May 2018, the 505 in June 2018, the 501 in October 2018, the 502, 503 as well as the 506 in 2019. The Commission approved the procurement of the new streetcars through a competitive bidding process on October 19, 2005. A request for information was issued on August 15, 2006 and was picked up by seven companies: AnsaldoBreda, Bombardier, Kinkisharyo, Mytram, Siemens, Skoda, and Vossioh-Kiepe. Only two companies, Bombardier and TRAM Power, submitted bids for the January 2008 request for proposals. On July 17, the TTC announced that neither company met the TTC's requirements. Bombardier's bid failed the technical evaluation, specifically not being able to negotiate curves on the system, and TRAM Power was deemed commercially non-compliant. The RFP was subsequently canceled and the Commission entered into a negotiated bidding process using the same technical specifications. Siemens and Bombardier each submitted bids which both met the TTC's requirements. Bombardier, the lowest bidder, was selected by the TTC in April 2009 to manufacture the new streetcars. The order was approved by city council and the $851 million contract was signed in June 2009. Mockup of the LRV for the legacy network on public display at Hillcrest. In 2007, the TTC began public consultation on the design of the new streetcars. Websites were launched for input and mock-ups from Bombardier and Siemens were displayed. A mock-up for Minneapolis-St. Paul Metro Transit's Bombardier Flexity Swift model was displayed at Yonge-Dundas Square on June of that year. This mock-up was previously displayed in 2005 in front of the Hummingbird Centre. At the 2007 Canadian National Exhibition, the TTC displayed the Bombardier mock-up again along with a Siemens Combino Plus mock-up built to Metro Sul do Tejo specifications. Promotional material from Bombardier used the image of the Flexity Outlook built for Brussels. In May 2010, the TTC solicited the public's help again with the launch of a new Website which asked the public to design and submit their own livery and interior scheme for consideration. They were also asked to submit names for the new streetcar. A soft mock-up, constructed of wood and foam board, was completed by the end of the summer of 2010 at the TTC's Hillcrest Complex. A final mock-up, set to be displayed for the public in early 2011, was displayed at the Hillcrest Complex from November 12 to 15, 2011. The streetcars are manufactured in Sahagun, Mexico, with final assembly taking place in Thunder Bay, Ontario. They are transported by train to the Hillcrest Complex via a rail spur. The first streetcar was transported by truck from the CP Rail yard as the spur had not been completed due to a delay in construction. Three prototypes were initially scheduled to be delivered in late 2011, however the first prototype did not arrive in Toronto until September 25, 2012. The other two were delivered in 2013. Static testing of some of the vehicle's systems such as the HVAC and CCTV cameras were performed at Hillcrest. On March 14, 2013, on-street testing commenced in the early hours of the morning and is on going. 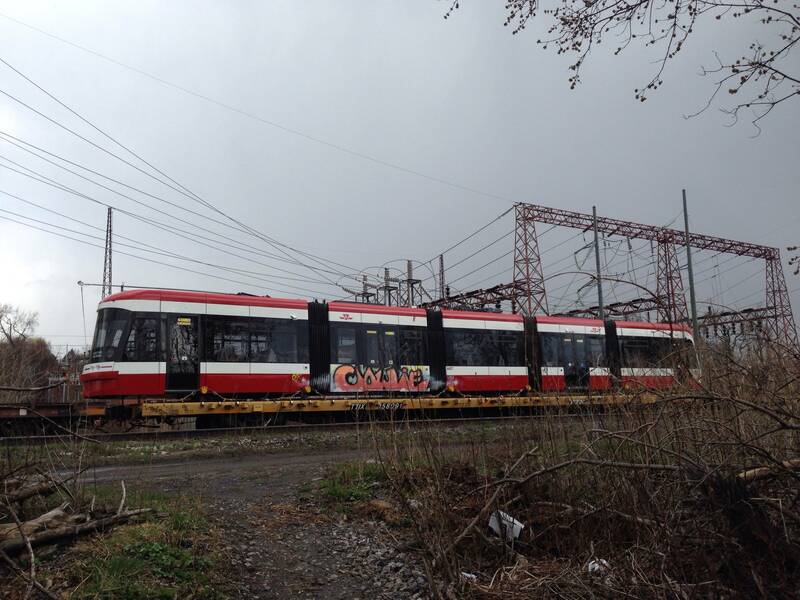 One streetcar was sent to the National Research Council in Ottawa for testing in a climate controlled setting. The design of the accessible, or 'D', module has been modified to allow for a slope that is more conducive to on-street loading. The location and installation of the ramp required structural modifications. Therefore, the first three cars built with the original design are having their modules replaced by Bombardier. The ramp design has also changed and will be retrofitted to existing cars in the near future. Following implementation on other vehicles, all seats in the accessible module have blue inserts. A workers' strike part way through the construction of 4404 and 4405 has delayed delivery of the cars. The strike lasted from July to September 2014. In addition to the labour disruption, Bombardier has experienced production and quality assurance issues that have significantly delayed delivery of cars 4405 and above. By the end of 2014, the TTC should have had 37 cars delivered. Only three cars were formally accepted by year's end. In 2015, Bombardier and the TTC agreed to a revised schedule that would see 23 new streetcars in Toronto by year's end. By October 2015, this no longer seemed to be a possibility. TTC board voted to pursue legal action against Bombardier. In May 2016, with 17 vehicles accepted by the TTC, Bombardier announced that they would shift manufacturing from Mexico to their La Pocatière, Quebec facility. Final assembly of their Flexity Freedom would move to their Millhaven site, and second assembly line dedicated to the TTC's streetcars would commence in early 2017. Bombardier anticipated that the TTC would have a total of 31 streetcars by the end of the year. For 2017, Bombardier plans to deliver 40 streetcars, followed by 76 in 2018, and 58 in 2019. Bombardier managed to complete their 30th streetcar by the end of 2016, with the TTC taking delivery on December 21, 2016. The last four streetcars delivered that year were sent in a semi-completed state. Final touches were carried out at the TTC's Leslie Barns. Bombardier was still committed to delivering 40 streetcars in 2017. As part of the contract with Bombardier, there is an option for 60 more streetcars that would meet growing demand. The TTC must decide whether to exercise the option when delivery of the 60th car occurs to keep the price low. However, because of the numerous delays and missed deadlines, the TTC issued a request for information (RFI) in September 2017 seeking a supplier to deliver up to 100 new streetcars. In October 2017, Bombardier announced that it would not meet its target of 40 streetcars. Blaming supply chain issues, Bombardier stated that they will only be able to deliver 35 streetcars in 2017. In the end, Bombardier managed to deliver only 29 streetcars. The second production line that was planed for the TTC streetcars at Bombardier's Millhaven facility was announced in February 2018. They plan to deliver 65 vehicles by the end of 2018 and 77 more in 2019, completing the order. The first car from Millhaven was expected to be delivered in the third quarter of 2018. On October 3, 2018, Bombardier Tweeted that their first car was completed in Millhaven and ready for testing. Cars 457﻿﻿0 and up are being assembled there. On July 4, 2018, the TTC announced that 67 of the new streetcars delivered will be taken out of service and sent to La Pocatière to fixed welding flaws. The cars will have to be stripped down to their frames and the welds corrected. Three to four streetcars at a time will be sent and could be gone for as many as 19 weeks per car. The welds are not a safety issue, but will affect the guaranteed service life of 30 years. Car 4401, which had other issues that needed to be rectified in addition to the welds, was sent to La Pocatière in May 2018. Car 4400 followed in September 2018. The TTC anticipates that all CLRVs and ALRVs will be replaced by 2019 rather than 2018 as originally planned. August 31, 2014 - Introduced on route 510 Spadina. Full conversion in January 2016. March 29, 2015 - All streetcars moved to route 509 Harbourfront due to track construction on Spadina. This decision is made permanent later. Full conversion in March 2017. July 11, 2015 - Temporary deployed on route 511 Bathurst for the Pan Am Games 2015. All new streetcars removed after July 22, 2015. June 19, 2016 - Introduced to a new route 514 Cherry. Full conversion in Summer 2017. September 3, 2017 - Introduced on route 512 St.Clair. Full conversion in September 2018. January 2018 - With implementation of King Street Pilot Project, Introduced permanently on route 504 King. Full conversion in January 2019. September 2, 2018 - Introduced on route 501 Queen on weekends. In January 2019, accessible service on the 501 added during the week when streetcars are available. First prototype; delivered to Hillcrest on September 29, 2012. Returned to the TTC from additional testing and factory modifications (revised accessible module) on July 4, 2014 and is now a production car. Entered service on August 31, 2014 on route 510. Sent back to Bombardier for repairs on September 7, 2018. Prototype car; Delivered to Hillcrest on June 17, 2013. Used for media ride on July 24, 2013. Used for public ride on June 11, 2014. Returned to Bombardier for modifications on May 14, 2018. Prototype car; Delivered to Hillcrest on March 25, 2013. Participant in the 2014 Beaches Easter Parade. Returned to Bombardier for modifications on June 12, 2015. Returned to TTC as a production car on November 24, 2016. Entered service on December 4, 2016 on route 510. Delivered to Hillcrest on May 31, 2014. Sent back to Bombardier for repairs on Febrary 20, 2019. Delivered to Hillcrest on November 11, 2014. Entered service on November 30, 2014 on route 510. Sent back to Bombardier for repairs on October 29, 2018. Delivered to Hillcrest on February 9, 2015. Entered service on March 2, 2015 on route 510. Sent back to Bombardier for repairs on April 10, 2019. Delivered to Hillcrest on March 18, 2015. Entered service on April 1, 2015 on route 509. Delivered to Hillcrest on April 22, 2015. Entered service on May 14, 2015 on route 509. Delivered to Hillcrest on June 10, 2015. Entered service on June 28, 2015 on route 510. Delivered to Hillcrest on July 23, 2015. Entered in service on August 11, 2015 on route 510. Delivered to Hillcrest on August 26, 2015. Entered in service September 9, 2015 on route 510. Delivered to Hillcrest on September 15, 2015. Entered in service September 28, 2015 on route 509. Delivered to Hillcrest on October 27, 2015. Entered in service November 10, 2015 on route 510. Delivered to Hillcrest on November 24, 2015. Entered in service December 4, 2015 on route 509. Delivered to Hillcrest on December 14, 2015. Entered in service December 24, 2015 on route 510. Delivered to Hillcrest on December 29, 2015. Entered in service January 14, 2016 on route 510. Delivered to Hillcrest on December 31, 2015. Entered in service February 1, 2016 on route 510. Delivered to Hillcrest on February 10, 2016. Entered in service February 19, 2016 on route 510. Delivered to Hillcrest on March 24, 2016. Entered in service April 8, 2016 on route 509. Delivered to Hillcrest on April 25, 2016. Entered service on May 4, 2016 on route 509. Delivered to Hillcrest on May 10, 2016. Entered service on May 21, 2016 on route 510. Displayed at Leslie Barns during Doors Open 2016. Delivered to Hillcrest on May 25, 2016. Entered service on June 11, 2016 on route 510. Operated on the launch trip for route 514 Cherry. Delivered to Hillcrest on June 18, 2016. Entered service on July 12, 2016 on route 510. Delivered to Hillcrest on July 26, 2016. Entered service on August 9, 2016 on route 510. Delivered to Hillcrest on September 8, 2016. Entered service on September 22, 2016 on route 510. Delivered to Hillcrest on October 6, 2016. Entered service on October 14, 2016 on route 510. Delivered to Hillcrest on October 27, 2016. Entered Service on November 6, 2016 route 509. Delivered to Hillcrest on November 28, 2016. Entered Service on December 8, 2016 on route 509. Delivered to Hillcrest on December 9, 2016. Entered service on December 16, 2016 on route 510. Delivered to Hillcrest on December 16, 2016. Entered service on December 24, 2016 on route 510. Delivered to Hillcrest on December 21, 2016. Entered service on December 31, 2016 on route 510. Delivered to Hillcrest on February 2, 2017. Entered service on February 11, 2017 on route 514. Delivered to Hillcrest on February 21, 2017. Entered service on March 2, 2017 on route 509. Delivered to Hillcrest on March 21, 2017. Entered service on April 1, 2017 on route 509. Delivered to Hillcrest on April 11, 2017. Entered service on April 27, 2017 on route 510. Delivered to Hillcrest on April 27, 2017. Entered service on May 20, 2017 on route 511. Delivered to Hillcrest on May 15, 2017. Entered service on May 30, 2017 on route 510. Delivered to Hillcrest on May 30, 2017. Entered service on June 9, 2017 on route 509. Delivered to Hillcrest on June 15, 2017. Entered service on June 26, 2017 on route 510. Delivered to Hillcrest on June 22, 2017. Entered service on July 7, 2017 on route 510. Delivered to Hillcrest on July 10, 2017. Entered service on July 19, 2017 on route 509. Delivered to Hillcrest on August 3, 2017. Entered service on August 25, 2017 on route 509. Delivered to Hillcrest on August 17, 2017. Entered service on September 1, 2017 on route 510. Delivered to Hillcrest on September 1, 2017. Entered service on September 15, 2017 on route 510. Delivered to Hillcrest on September 14, 2017. Entered service on October 7, 2017 on route 514. Delivered to Hillcrest on September 19, 2017. Entered service on October 5, 2017 on route 514. Delivered to Hillcrest on September 27, 2017. Entered service on October 11, 2017 on route 512. Delivered to Hillcrest on October 11, 2017. Entered service on October 20, 2017 on route 510. Delivered to Hillcrest on October 12, 2017. Entered service on October 26, 2017 on route 510. Delivered to Hillcrest on October 26, 2017. Entered service on November 9, 2017 on route 512. Delivered to Hillcrest on October 31, 2017. Entered service on November 15, 2017 on route 509. Delivered to Hillcrest on November 23, 2017. Entered service on December 1, 2017 on route 509. Delivered to Hillcrest on November 24, 2017. Entered service on December 5, 2017 on route 512. Delivered to Hillcrest on November 27, 2017. Entered service on December 9, 2017 on route 509. Delivered to Hillcrest on December 4, 2017. Entered service on December 14, 2017 on route 514. Delivered to Hillcrest on December 5, 2017. Entered service on December 20, 2017 on route 514. Delivered to Hillcrest on December 14, 2017. Entered service on December 30, 2017 on route 512. Delivered to Hillcrest on December 18, 2017. Entered service on December 28, 2017 on route 504. Delivered to Hillcrest on December 27, 2017. Entered service on January 10, 2018 on route 514. Delivered to Hillcrest on December 22, 2017. Entered service on January 6, 2018 on route 504. Delivered to Hillcrest on January 2, 2018. Entered service on January 17, 2018 on route 510. Delivered to Hillcrest on January 5, 2018. Entered service on January 26, 2018 on route 504. Delivered to Hillcrest on January 18, 2018. Entered service on February 3, 2018 on route 514. Delivered to Hillcrest in late January, 2018. Entered service on February 13, 2018 on route 509. Delivered to Hillcrest on February 5, 2018. Entered service on February 24, 2018 on route 510. Delivered to Hillcrest on February 15, 2018. Entered service on March 9, 2018 on route 504. Initially delivered to Hillcrest on February 20, 2018. However, the unit was damaged while on delivery. As a result, it was sent back to Bombardier for repairs. Returned to the TTC on June 14, 2018. Entered service on July 1, 2018 on route 504. Delivered to Hillcrest on February 26, 2018. Entered service on March 17, 2018 on route 504. Delivered to Hillcrest on March 5, 2018. Entered service on March 21, 2018 on route 504. Delivered to Hillcrest on March 12, 2018. Entered service on April 12, 2018 on route 510. Delivered to Hillcrest on March 19, 2018. Delivered to Hillcrest on April 2, 2018. Entered service on April 18, 2018 on route 514. Caught in flash-flooding at King & Sudbury Aug. 7, 2018. Sent to Bombardier's facility in Kanona, NY on April 3, 2019 for repairs and de-contamination. Delivered to Hillcrest on March 28, 2018. Entered service on April 14, 2018 on route 514. Delivered to Hillcrest on April 9, 2018. Entered service on April 28, 2018 on route 514. Delivered to Hillcrest on April 23, 2018. Entered service on May 8, 2018 on route 514. Delivered to Hillcrest on April 30, 2018. Entered service on May 26, 2018 on route 512. Delivered to Hillcrest on May 11, 2018. Entered service on May 24, 2018 on route 514. Delivered to Hillcrest in late May, 2018. Entered service on June 13, 2018 on route 514. Entered service on June 1, 2018 on route 504. Caught in flash-flooding at King & Atlantic Aug. 7, 2018. Sent to Bombardier's facility in Kanona, NY on January 24, 2019 for repairs and de-contamination. Entered service on June 14, 2018 on route 514. Delivered to Hillcrest on June 5, 2018. Entered service on June 22, 2018 on route 514. Delivered to Hillcrest on June 6, 2018. Entered service on June 24, 2018 on route 511. Delivered to Hillcrest on June 12, 2018. Entered service on June 29, 2018 on route 512. Delivered to Hillcrest on June 21, 2018. Entered service on July 14th, 2018 on route 511. Delivered to Hillcrest on June 15, 2018. Entered service on July 6, 2018 on route 509. Delivered to Hillcrest on June 27, 2018. Entered service on July 18, 2018 on route 512. Delivered to Hillcrest on June 29, 2018. Entered service on July 28, 2018 on route 504. Delivered to Hillcrest on June 28, 2018. Entered service on July 24, 2018 on route 510. Delivered to Hillcrest on July 4, 2018. Entered service on August 2, 2018 on route 512. Delivered to Hillcrest on July 10, 2018. Entered service on August 29, 2018 on route 509. Delivered to Hillcrest on July 18, 2018. Entered service on August 8, 2018 on route 509. Delivered to Hillcrest on July 23, 2018. Entered service on August 11, 2018 on route 512. Delivered to Hillcrest on August 2, 2018. Entered service on August 21, 2018 on route 504. Delivered to Hillcrest on August 3, 2018. Entered service on August 24, 2018 on route 504. Delivered to Hillcrest on August 15, 2018. Entered service on August 31, 2018 on route 509. Delivered to Hillcrest on August 20, 2018. Entered service on September 7, 2018 on route 509. Delivered to Hillcrest on August 27, 2018. Entered service on September 11, 2018 on route 510. Delivered to Hillcrest on September 4, 2018. Entered service on September 14, 2018 on route 510. Delivered to Hillcrest on September 7, 2018. Entered service on September 20, 2018 on route 504. Delivered to Hillcrest on September 13, 2018. Entered service on September 25, 2018 on route 512. Delivered to Hillcrest on September 17, 2018. Entered service on October 2, 2018 on route 512. Delivered to Hillcrest on September 25, 2018. Entered service on October 10, 2018 on route 509. Delivered to Hillcrest on October 1, 2018. Entered service on October 13, 2018 on route 504. Delivered to Hillcrest on October 9, 2018. Entered service on October 20, 2018 on route 504. Delivered to Hillcrest on October 10, 2018. Entered service on November 6, 2018 on route 510. Delivered to Hillcrest on October 11, 2018. Entered service on October 26, 2018 on route 512. Delivered to Hillcrest on October 29, 2018. Entered service on November 9, 2018 on route 304. Delivered to Hillcrest on November 1, 2018. Entered service on November 16, 2018 on route 510. Delivered to Hillcrest on November 5, 2018. Entered service on December 5, 2018 on route 512. Delivered to Hillcrest on November 9, 2018. Entered service on November 24, 2018 on route 512. Delivered to Hillcrest on November 14, 2018. Entered service on November 29, 2018 on route 509. Delivered to Hillcrest on November 21, 2018. Entered service on December 2, 2018 on route 510. Delivered to Hillcrest on December 4, 2018. Entered service on December 13, 2018 on route 504. Delivered to Hillcrest on December 6, 2018. Entered service on December 19, 2018 on route 512. Delivered to Hillcrest on December 11, 2018. Entered service on December 20, 2018 on route 512. Delivered to Hillcrest on December 12, 2018. Entered service on December 22, 2018 on route 304. Delivered to Hillcrest on December 14, 2018. Entered service on December 29, 2018 on route 512. Delivered to Hillcrest on December 19, 2018. Entered service on December 30, 2018 on route 510. Delivered to Hillcrest on December 27, 2018. Entered service on January 10, 2019 on route 504. Delivered to Hillcrest on December 28, 2018. Entered service on January 18, 2019 on route 510. Delivered to Hillcrest on December 31, 2018. Entered service on January 16, 2019 on route 504. Delivered to Hillcrest on January 3, 2019. Entered service on January 19, 2019 on route 510. Delivered to Hillcrest on January 18, 2019. Entered service on February 6, 2019 on route 509. Delivered to Hillcrest on January 22, 2019. Entered service on February 1, 2019 on route 504. Delivered to Hillcrest on January 24, 2019. Entered service on February 10, 2019 on route 510. Delivered to Hillcrest on February 15, 2019. Entered service on February 28, 2019 on route 504. Delivered to Hillcrest on February 14, 2019. Entered service on February 24, 2019 on route 510. Delivered to Hillcrest on March 4, 2019. Entered service on March 16, 2019 on route 509. Delivered to Hillcrest on February 22, 2019. Entered service on March 20, 2019 on route 504. Delivered to Hillcrest on February 26, 2019. Entered service on March 9, 2019 on route 510. Delivered to Hillcrest on March 7, 2019. Entered service on March 23, 2019 on route 501. Delivered to Hillcrest on March 12, 2019. Entered service on March 25, 2019 on route 510. Delivered to Hillcrest on March 22, 2019. Entered service on April 13, 2019 on route 510. Delivered to Hillcrest on March 27, 2019. Entered service on April 10, 2019 on route 504. Delivered to Hillcrest on March 21, 2019. Entered service on April 1, 2019 on route 510. Delivered to Hillcrest on March 25, 2019. Delivered to Hillcrest on April 1, 2019. Entered service on April 12, 2019 on route 510. Delivered to Hillcrest on April 5, 2019. Entered service on April 18, 2019 on route 504. Delivered to Hillcrest on April 8, 2019. Delivered to Hillcrest on April 10, 2019. Delivered to Hillcrest on April 15, 2019. Delivered to Hillcrest on April 22, 2019. Delivered to Hillcrest on December 17, 2018. First unit delivered from Millhaven faculty. Entered service on January 11, 2019 on route 504. Delivered to Hillcrest on February 19, 2019. Entered service on March 10, 2019 on route 501. Delivered to Hillcrest on April 17, 2019. ↑ TTC Cancels Streetcar RFP (Press release). Toronto Transit Commission. 17 July 2008. Retrieved on 08 December 2010. ↑ New Streetcar Delivery and Claim Negotiation Update. Report. 20 December 2016. Toronto Transit Commission.